Like other organisms, plants are exposed to a wide variety of pathogens including viruses, bacteria, fungi, nematodes and protozoa that limit plant productivity. For protection, plants have evolved a complex immune system that recognizes "non-self" invading organisms on multiple levels. Work in my lab with Arabidopsis thaliana focuses on a particular class of intracellular immune sentinels called resistance proteins that monitor the inside of the plant cell for the presence of foreign pathogen proteins. These pathogen proteins get injected into the host cell by the pathogen and, if not detected by the host, proceed to suppress the plant immune system or to turn the plant cell into a nutrient source for the pathogen. Plant resistance proteins are therefore an essential weapon in a plant's arsenal against pathogens. However, this protection comes at a cost when the immune system is not well regulated. 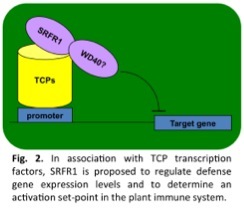 Our current work focuses on a negative regulator of immunity called SRFR1 that we hypothesize functions to balance immune system activation and repression by spatially and temporally controlling protein-protein interactions in the plant immune system. 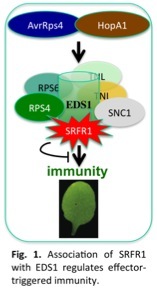 One important function of SRFR1 is connected to its interaction with the positive immune regulator EDS1, which we found is targeted by two unrelated bacterial effectors, AvrRps4 and HopA1. SRFR1 in this complex appears to control how easily resistance proteins of the TIR-NB-LRR class are activated by these effectors (Fig. 1). Like EDS1, SRFR1 is likely to have additional functions not directly connected to resistance proteins. For instance, SRFR1 also interacts with transcription factors in the TCP family. In this case SRFR1 functions in a transcriptional repressor complex that regulates defense gene expression levels (Fig. 2). We are currently exploring how post-translational protein modifications influence changes in composition and localization of SRFR1-containing protein complexes. We also have a long-standing interest in the function of membrane transporters in various aspects of plant physiology. Recently, we characterized a powdery mildew-inducible nitrate transporter of the NPF3 family in grapevine and Arabidopsis in collaboration with Daniel Schachtman, and determined the transport properties of the Tassel-less1 boron transporter in maize in collaboration with the lab of Paula McSteen. 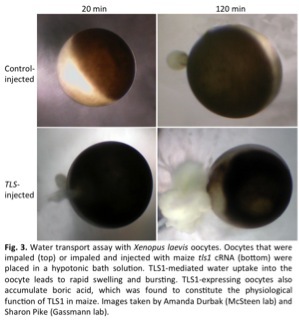 Durbak AR, Phillips KA, Pike S, O’Neill MA, Mares J, Gallavotti A, Malcomber ST, Gassmann W, and McSteen P. Transport of boron by the tassel-less1 aquaporin is critical for vegetative and reproductive development in maize. Plant Cell 2014; doi: 10.1105/tpc.114.125898. Kim SH, Son GH, Bhattacharjee S, Kim HJ, Nam JC, Nguyen PDT, Hong JC, and Gassmann W. The Arabidopsis immune adaptor SRFR1 interacts with TCP transcription factors that redundantly contribute to effector-triggered immunity. Plant J. 2014;78: 978-989. Pike S, Gao F, Kim MJ, Kim SH, Schachtman D, and Gassmann W. Members of the NPF3 transporter family encode pathogen-inducible nitrate/nitrite transporters in grapevine and Arabidopsis. Plant Cell Physiol. 2014;55: 162-170. Léran S, Varala K, Boyer JC, Chiurazzi M, Crawford N, Daniel-Vedele F, David L, Dickstein R. Fernandez E, Forde B, Gassmann W, Geiger D, Gojon A, Gong JM, Halkier BA, Harris JM, Hedrich R, Limami AM, Rentsch D, Seo M, Tsay YF, Zhang M, Coruzzi G, and Lacombe B. A unified nomenclature of NITRATE TRANSPORTER 1/PEPTIDE TRANSPORTER family members in plants. Trends Plant Sci. 2014;19: 5-9. Howard BE, Hu Q, Babaoglu AC, Chandra M, Borghi M, Tan X, He L, Winter-Sederoff H, Gassmann W, Veronese P and Heber S. High-throughput RNA sequencing of Pseudomonas-infected Arabidopsis reveals hidden transcriptome complexity and novel splice variants. PLoS ONE 2013;8: e74183. Bhattacharjee S, Garner CM, and Gassmann W. New clues in the nucleus: transcriptional reprogramming in effector-triggered immunity. Front. Plant Sci. 2013;4:364. Gassmann W, and Bhattacharjee S. (2012) Effector-triggered immunity signaling: from gene-for-gene pathways to protein-protein interaction networks. Mol. Plant-Microbe Interact. 2012;25: 862-868 (pdf). Zhang XC and Gassmann W. Quantifying alternatively spliced mRNA via capillary electrophoresis. 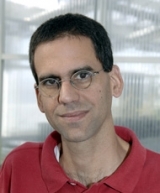 Methods in Molecular Biology 2011(Clifton, N.J.);712:69-77. Li JY, Fu YL, Pike SM, Bao J, Tian W, Zhang Y, Chen CZ, Li HM, Huang J, Li LG, Schroeder JI, Gassmann W and Gong JM. The Arabidopsis nitrate transporter NRT1.8 functions in nitrate removal from the xylem sap and mediates cadmium tolerance. Plant Cell 2010;22(5):1633-1646. Gao F, Shu X, Ali MB, Howard S, Li N, Winterhagen P, Qiu W, Gassmann W. A functional EDS1 ortholog is differentially regulated in powdery mildew resistant and susceptible grapevines and complements an Arabidopsis eds1 mutant. Planta 2010;231(5): 1037-1047. Pike S, Patel A, Stacey G, Gassmann W. Arabidopsis OPT6 is an oligopeptide transporter with exceptionally broad substrate specificity. Plant and Cell Physiology 2009;50(11):1923-1932. Kim SH, Kwon SI, Saha D, Anyanwu NC, Gassman W. Resistance to the Pseudomonas syringae effector HopA1 is governed by TIR-NBS-LRR Protein rps6 and is enhanced by mutations in SRFR1. Plant Physiology 2009;150:1723-1732. Gassmann W. Alternative splicing in plant defense. Current Topics in Microbiology and Immunology 2008;326:219-233. Stacey MG, Patel A, McClain WE, Mathieu M, Remley M, Rogers EE, Gassmann W, Blevins DG, and Stacey G. The Arabidopsis AtOPT3 protein functions in metal homeostasis and movement of iron to developing seeds. Plant Physiology 2008;146:589-601. Zhang XC, and Gassmann W. Alternative splicing and mRNA levels of the disease resistance gene RPS4 are induced during defense responses. Plant Physiology 2007;145: 1577-1587. Durrett TP, Gassmann W, and Rogers EE. The FRD3-mediated efflux of citrate into the root vasculature is necessary for efficient iron translocation. Plant Physiol. 2007;144, 197-205. Liu Y, Ren D, Pike S, Pallardy S, Gassmann W, and Zhang S. Chloroplast-generated reactive oxygen species are involved in hypersensitive response-like cell death mediated by a mitogen-activated protein kinase cascade. Plant J. 2007;51(6):941-954. Faigón-Soverna A, Harmon FG, Storani L, Karayekov E, Staneloni RJ, Gassmann W, Más P, Casal JJ, Kay SA, and Marcelo J. Yanovsky MJ. A constitutive shade-avoidance mutant implicates TIR-NBS-LRR proteins in Arabidopsis photomorphogenic development. Plant Cell 2006;18: 2919-2928. Osawa H, Stacey G and Gassmann W. ScOPT1 and AtOPT4 function as proton-coupled oligopeptide transporters with broad but distinct substrate specificities. Biochem. J 2006;393:267-275. Stacey MG, Osawa H, Patel A, Gassmann W and Stacey G. Expression analyses of Arabidopsis oligopeptide transporters during seed germination, vegetative growth and reproduction. Planta 2006; 223:291-305. Gassmann W. Natural variation in the Arabidopsis response to the avirulence gene hopPsyA uncouples the hypersensitive response from disease resistance. Mol. Plant-Microbe Interact. 2005;18:1054-1060. Pike SM, Zhang XC and Gassmann W. Electrophysiological characterization of Arabidopsis avrRpt2-specific HR in the absence of other bacterial signals. Plant Physiol 2005;138(2):1009-1017. Kwon SI, Koczan JM, and Gassmann W. Two Arabidopsis srfr (suppressor of rps4-RLD) mutants exhibit avrRps4-specific disease resistance independent of RPS4. Plant J 2004;40:366-375.